When Congress passed the Tax Cuts and Jobs Act (TCJA), a/k/a Trump's tax code overhaul in early 2017, the big expectation for tax season 2018 - the first tax-filing season under the new tax law - was that virtually all Americans would end up receiving a bigger refund. And yet, as numerous analysts have noted, as many as tens of millions more taxpayers will end up with no refund, or a smaller one, compared with a year ago, before the lower rates fully took effect. First, the facts: with about 10% of households having filing their returns through the weekend, the percentage of households getting tax refunds is similar to last year, but the average refund size is down 8%, to $1,865. The number of returns filed so far -16 million - is also down 12% from the similar point a year ago. Furthermore, as the WSJ notes, the picture will become clearer later this month, as tens of millions more returns are processed, and while the IRS had been partially shut down in the run-up to filing season, the US tax agency says it is running smoothly so far (although all that may change on Friday should the government be shut again should a border deal not be reached between Trump and the Democrats). Meanwhile, in absolute terms, about two-thirds of US households are getting tax cuts for 2018 under the law, and just 6% are paying more, according to the Tax Policy Center. But the size of those tax cuts may not be reflected in refunds, which are just the end-of-year reconciliation of what a taxpayer owes and what was withheld or paid during the year. As Bank of America observes, many taxpayers received much of the benefit through reduced paycheck-withholding throughout 2018, leaving nothing for the actual refund. Here's the issue in a nutshell: while in 2018, personal income grew by 4% tax withholding actually fell by 0.6%. Analyzing the relationship between income and tax withholdings, BofA found that if withholdings had grown in line with income, tax withholdings would have been approximately $90bn higher. That is, about $90BNn of the tax cuts have already been paid out to households through the new withholding tables, which reflect the lower tax rates and the doubling of the standard deduction from the TCJA. Said otherwise, overall refunds will be $90BN less than if withholdings stayed constant. That said, on average refunds should still be larger than usual according to estimates from Evercore ISI and Morgan Stanley, although tax experts and preparers expect many households to be surprised by the size of their refunds—in both directions—and, on balance, millions of people may shift from getting refunds to owing taxes. Needless to say, they won't be happy, having expected - and likely already spent - a far greater refund than in 2018, especially since a clear majority of Americans - four out of five, according to the Tax Policy Center in Washington - are supposed to see a reduction in taxes. The Internal Revenue Service offers ongoing guidance to help employees and employers decide how much money to withhold from paychecks so that most income taxes are paid automatically and gradually throughout the year. The shifting tax brackets - they now start at 10 percent and top out at 37 percent for income about $500,000 - plus changes to exemptions, deductions and credits meant that many taxpayers needed to adjust their withholding. But most taxpayers were confused how to do so, according to tax adviser H&R Block Inc. (The IRS reworked its calculations, but the updated tables didn’t translate precisely from the old law.) Home Depot Inc. found that only 1 percent of its employees had altered their withholding. End result: fewer, and smaller, tax refunds. The IRS expects to issue 105.8 million refunds this year, down 2 percent from last year’s 108.3 million. According to Ernie Tedeschi, a former Treasury Department economist who analyzed the topic for research firm Evercore ISI, many taxpayers with incomes below $100,000 will get their tax cut in the form of a bigger refund, while those with higher incomes got the tax cut in the form of higher paychecks throughout 2018 - and therefore might be expecting refunds that aren’t coming. Analysts anticipate the total dollar amount refunded to be slightly higher, meaning some people will get bigger refunds than in the past. Among them are couples with children, since the standard deductions for filing as a couple, as well as the child tax credit, both almost doubled in the revised tax code. Some Americans won't be getting a refund at all. More than 30 million Americans - 21 percent of taxpayers - didn’t have enough taken out of their paychecks throughout the year, meaning they will owe the IRS will they file their returns this year, according to a study from the Government Accountability Office. That’s an increase from 18 percent of taxpayers who were under-withheld last year. That means about 5 million people who got a refund last year won’t be getting one this year. Some taxpayers have turned to Twitter to vent their unhappiness after completing their tax returns and seeing the bottom line. A representative sample: "I filed my 2018 tax return today as a substitute teacher. My refund will be 40% less than the refund I got last year." What does this mean for consumer spending? Despite fewer tax refunds overall, Wall Street analysts are expecting to see a boost in spending from the lower-income consumers who will benefit from the expansion of the child tax credit. Middle-income households, those earning from $55,000 to $75,000 a year, will also see benefits, with as much as half of their tax-cut bounty showing up in refunds, Wells Fargo said. The tax-cut sugar high could be short lived, however, the Congressional Budget Office said the effects of the tax cuts are set to wane in the coming quarters. According to an analysis from Bank of America, the extra income from tax refunds could support greater consumer spending, however the bank sees reasons to fade some of the potential boost to spending. One reason is that a large share of the child tax credit will to go upper income households who are likely to have a lower marginal propensity to consume out of tax refunds. Also, those high income households in high tax states will need to account for the change in the SALT deductions which could lead to a significant decline in refunds or need to pay additional taxes during tax season. Also as noted above, in 2018, personal income grew by 4% but tax withholding fell by 0.6% as a result of smaller withholdings (and lower refunds in 2019). That means that much of the consumption benefit from lower taxes already took place in 2019, at the same time as the lower-taxed incomes were earned. Then there is the impact of SALT: under the previous tax code, state and local tax deductions were one of the more popular tax breaks. In the 2017 tax filing season, over 33 million tax returns (roughly 22% of all returns) had deducted state and local taxes on their tax returns. 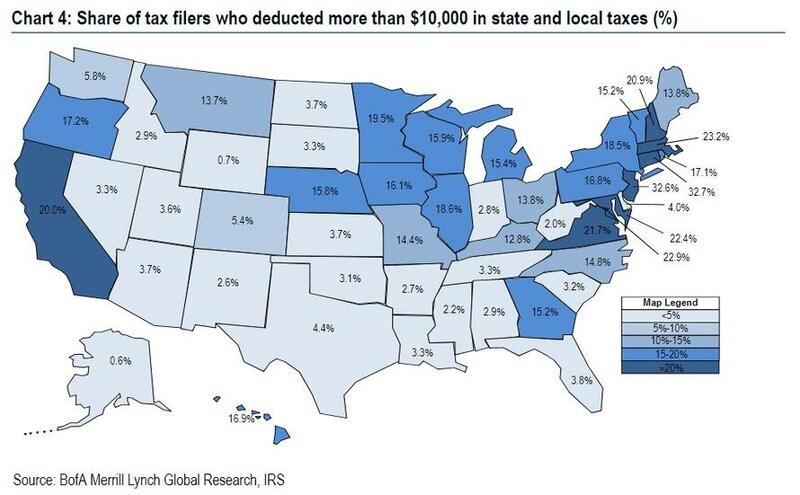 However, under TCJA, deductions of state and local taxes will now be capped at $10,000, raising the tax burden on many tax filers from high tax states such as New Jersey, Connecticut and California . For many, the impact will be nontrivial. In dollar terms, BofA estimates that the lost deductions would cost each impacted tax filer, on average, an additional $3,000 in federal taxes in 2019. Some may see a partial reprieve from lower marginal tax rates. However, this implies, many tax filers will see a substantial reduction in tax refunds or worse may need to pay additional taxes during tax season, potentially leading some households to forgo or delay consumption as they adjust to the new tax code. Bottom line: under the aggregate numbers, BofA finds many different tax situations with clear winners and losers which could distort spending patterns as households adjust to their new tax reality. Translation: anyone who expected a uniform boost in refunds will be disappointed. Finally, what are the political ramifications of this? According to Bloomberg, fewer people getting refunds will give U.S. Democrats, who now hold a majority in the House of Representatives, an opening to question how much the tax law benefited the middle class. Only about 45% of voters approve of the tax cut, according to recent polls, and many Republicans in high-tax states already lost their seats in the 2018 midterm elections due to the changes in the deductibility of state and local taxes. Looking ahead to the 2020 presidential election, dissatisfaction with the tax law may give Democrats an opening to promise tax changes of their own, ones that favor the middle class.